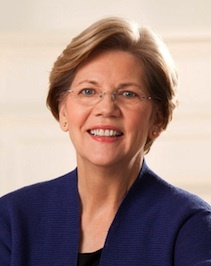 Will You Help Elizabeth Warren Save the Fiduciary Reg? Fundsters and broker-dealer executives, a top DoL rule defender in Washington is asking for your help in protecting that rule. If you've already spent millions of dollars preparing for the reg, you may want to watch for a letter in the mail from a politician who is not exactly known as a friend of Wall Street. Yesterday Senator Elizabeth Warren (D-Massachusetts), the outspoken anti-Wall Street populist, sent letters to 33 big financial firms, the Wall Street Journal reports, including big banks, insurance companies, and pureplay B-Ds and asset managers. Warren specifically targeted firms that have already revealed their impending adaptations to the DoL's fiduciary regulation, and she wants to know if they will fight or support a possible delay of the rule. Barron's and Pensions & Investments also reported on Warren's letters. Warren has been a vocal supporter of the fiduciary reg, she's probably anticipating a possible delay or even repeal of the reg after President-elect Donald Trump takes office today. Indeed, one of Trump's key advisors has compared the fiduciary rule to an infamous 19th century Supreme Court decision that defended slavery. So, if you want to protect your fiduciary reg investment, write Warren back. The companies Warren wrote to yesterday, the WSJ reports, include: wirehouses Bank of America Merrill Lynch, Morgan Stanley, UBS, and Wells Fargo; other big brokerages like Cambridge, Charles Schwab, Commonwealth, Edward Jones, LPL, Raymond James, and TD Ameritrade; big asset managers like BlackRock, Fidelity, Legg Mason, and Vanguard; and a host of insurers and other financial services shops that have B-D or asset management subisidiaries, like Allianz, Ameriprise, J.P. Morgan, John Hancock, MassMutual, Principal, Prudential, RBC, Transamerica, and Voya.